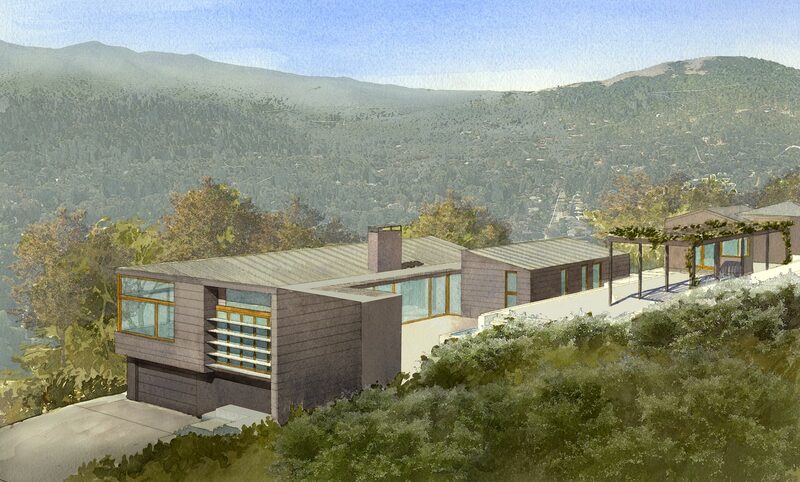 At the east edge of the town of Ross, in Marin County, this residence is undergoing a complete reconstruction on its existing footprint, as well as new additions, essentially creating a new house. Enjoying almost complete visual privacy from below, the property is naturally screened from view on top of a verdant hill. New additions from both ends of the house are confined to its uphill side for discretion, and sit comfortably within the site setbacks. The new main level is housed in an ‘L’-shaped volume with shed roof, containing the living, family and dining rooms, kitchen and guest quarters. This “L” is bordered by a courtyard and flat-roofed volume that houses the formal entry gallery and connecting circulation to the northern master suite addition. Large windows and folding and sliding doors connect the home to its courtyard and gardens, and expansive views of Ross Valley and Mount Tamalpais. The lower level contains the children’s quarters, entertainment room, service spaces and a 2-car garage. Uphill from the main house is a terraced series of ‘outdoor rooms’, connected by a new series of concrete stairs and planters. A new steel trellis covers the outdoor kitchen, which is flanked by a new bocce lawn. Further uphill, the existing swimming pool was modernized new equipment, and the surrounding terrace resurfaced in concrete pavers. We chose exterior materials with subtle texture and color variances to articulate the home’s volumes—cementitious panels, hot-rolled steel panels and stucco—all of which are ignition-resistant in keeping with the Wildland Urban Interface Zone of Ross. The roof, being visible from the upper terraces, was treated as an equal visual element, and clad in a muted, matte grey standing seam metal panel system.